This is the perfect time of year for baking. Though we haven’t exactly hit spring in full force yet, we can almost already hear summer approaching with its humid days that make turning on the oven an uncool adventure. Plus, it’s not the dead of winter, so after we indulge in cookies and a big class of milk, we could, technically, take out our bikes for a ride in the park. There’s something quaint about the idea of filling the cookie jar. It evokes the days of coming home from school, dropping the backpack, and heading to the kitchen for a snack. For some of us, those after-school cookies were probably Oreos, Milanos, and Chessman, but homemade cookies are even more magical. All of the delicious baked goods below keep well for more than a week. If you practice self-restraint, your cookie jar will be half full for quite a while. Best of all, pack up a patch of cookie jar cookies in a box, tie it with pretty ribbon, and send it off to the sweetest person in your life–Mom. What are your favorite kinds of cookies? Do you keep the cookie jar full? 1. 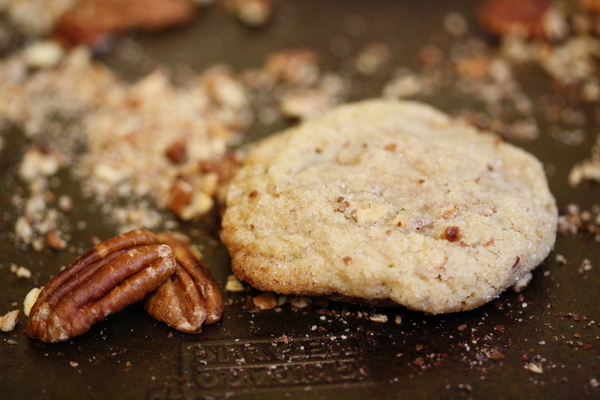 Yes, Pecan Cookies! These butterscotch-flavored, nutty concoctions were invented for an inauguration party in January 2009. Whatever your feelings about how Obama’s presidency is going, his campaign slogan goes to good use in these cookies. 2. Coffee Sables Filled with Chocolate Ganache. We developed these coffee sable cookies as part of a bite-sized tiramisu dish for a party we were catering. But when my dough yielded far more little circles than I’d expected, I was left with coffee sable cookies to play around with. 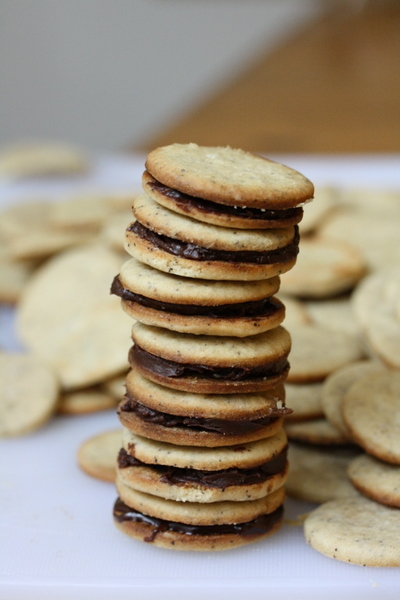 I sandwiched them together with spoonfuls of chocolate ganache–wow! These sables use ground coffee-not espresso powder, which is normally used in baking–to great effect. 3. Espresso Biscotti. Biscotti are made for the cookie jar–they might even get better with time! 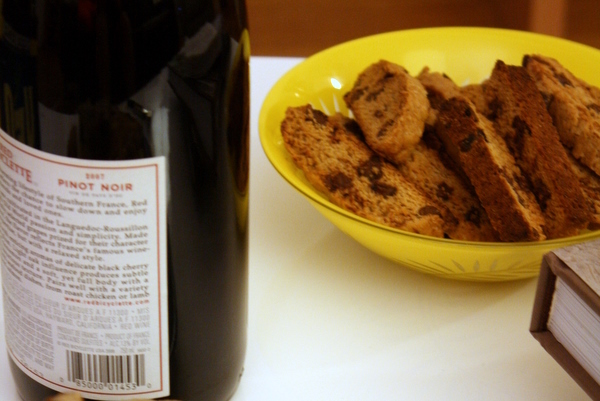 When I started messing around with biscotti recipes, I was struck by how straightfoward and sturdy they were. Whereas in good old-fashioned drop cookies, the soft chips disappear into the soft dough, here the melty chips make for an unusual contrast with the crisp of the espresso background. Good dipped in coffee, hot chocolate, and even tea. 4. 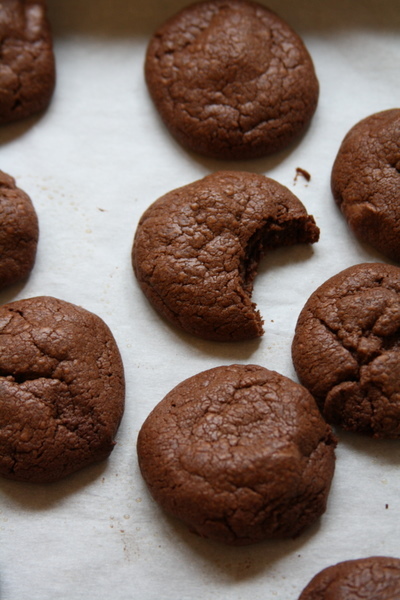 Dark Chocolate Cookies with Milk Chocolate Chunks. I have a very clear memory of making a similar cookie back in high school. Kate, my younger sister, and I had been dying to make it for ages. We finally loaded up on chocolate on a mom-sponsored trip to the market, and we came back ready to bake. Unbeknown to us, the fancy Valrhona chocolate bar we’d acquired was flavored with orange–it gave the cookies a haunting, fruity taste, which we couldn’t quite place. Try it if you’re feeling adventurous; otherwise stick to good–but plain–chocolate for these rich, delicious indulgences. 5. Double Ginger Snaps. Since we love sugar, we love occasions when you get to eat more of it, like Valentine’s Day and Easter. If the people in your life like sugar, too, then helping them fill up their cookie jars is a no brainer. For holidays, birthdays, or just whenever, these dunking cookies make a delicious gift. 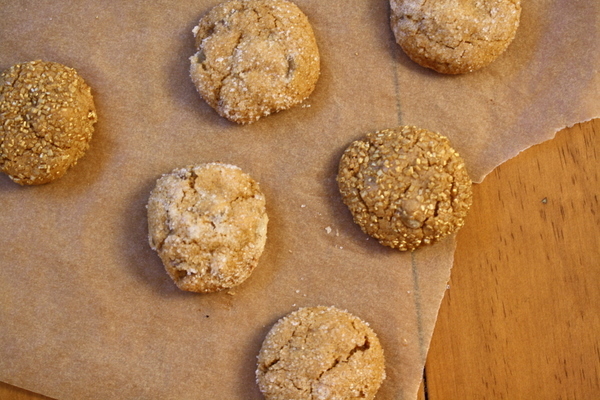 Mix up a few dozen and pack them prettily, and you’re as golden as a freshly baked batch of gingersnaps. 6. 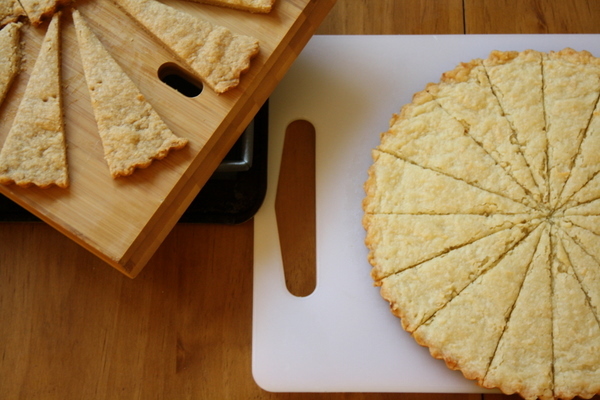 Brown Sugar (and/or Coconut) Shortbread. A really nice thing about shortbread is that you don’t have to cream the butter and sugar the way you do for a lot of the best desserts. There’s something a whole lot less fussy about it, and then there’s the added plus that if you don’t own any kind of mixer, you’ll save your forearms the arduous task of mixing. Because in shortbread, you use your fingers to wedge the flour particles into the butter, making for a tender, crumbly cookie. In fact, the ingredient list is so minimal and the process so simple I was driven to re-complicate, making two flavored versions: coconut and brown sugar. Being a bit plain, these cookies make a great garnish for lemon pudding or chocolate mousse.